Linkedin’s career building tools has never been complete until now that the professional network decided to add “salary information” to user’s profile. Linkedin has introduced a new tool called LinkedIn Salary; these tool aims to help users learn more about the salaries in their industry and how making changes to their current career impacts how much they make. LinkedIn is not the first company to try to bring more transparency to salary information — Glassdor has a similar product for helping people determine whether they are being paid fairly — but the company says it is more focused on helping its users maximize their potential rather than assessing fairness or whether a particular salary is competitive. 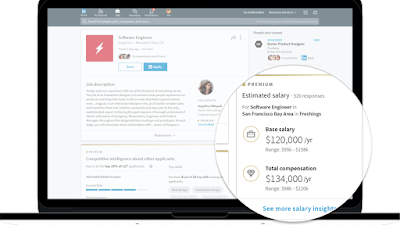 According to Linkedin, the goal of this salary feature is to "help professionals around the world make better career decisions and optimize their earning potential now."